Adding a drum loop on top of a programmed MIDI beat is a quick way to give it a more fluid, natural sound. Think of the MIDI clip as the base of the beat, and the loop as the ornamentation. Unfortunately, Drum Rack and Impulse can’t warp samples, so unless the loop that you’re using was recorded at the same tempo as the track you’re making (and is perfectly in time), you’ll need to add it to a separate audio track. Add the loop to an empty audio track, then group the drum rack and the loop together to make it easier to apply effects to the drums as a whole. This percussion loop was recorded at 126 beats per minute, but the track we’re making is 130 bpm. To use this loop in this track, we’ll need to warp it. Double-click the loop clip, then click the “Warp” button (if you have auto-warp enabled in Ableton’s Preferences section, it will have already warped it for you). Select “Complex” warping mode; this will make the warping sound smoother. Ableton will place a warp marker (a little yellow triangle) on each transient (the beginning of a distinct drum sound) in the loop, then move the warp markers onto the closest beats. If necessary, you can set the warp markers’ positions manually by dragging them left and right. Click the “Loop” button, then play the MIDI drum pattern and the loop together. Drop an Auto filter plug-in onto the drum loop, then set it to bandpass mode. Drag the frequency control to about the middle. Turn the LFO about halfway up, then turn on synchronization and set the rate to 8. Turn “Phase” down to zero. The filter will now sweep smoothly up and down, causing the loop to rise up out of, then drop down into, the main beat. 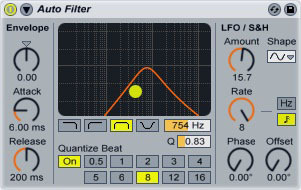 For a cool filter effect, turn on the “Quantize Beat” function on the Auto Filter, then click “8.” Now, instead of moving smoothly up and down, the filter will quickly jump to the next frequency on every ½ note beat. Use Ableton’s resonator to create a rhythmic melody from the drum loop. Drop a Resonator onto the loop’s audio track, then turn the “Dry/Wet” control up to about 30%. Turn the “Gain” knob up to around 8. These settings will allow both the original loop and the resonated melody to come through. Set the notes for the melody using the “Note” and “Pitch” knobs. To start with, leave the “Note” knob set to “C,” then turn the first “Pitch” knob up to +4 and the second “Pitch” knob to +7. These settings correspond to the notes in a C major chord. Play the drum loop to hear the melody, then adjust the pitch and note knobs as needed. To switch to a C minor melody, for example, turn the first pitch knob down to +3.